The Daily Dimwit: Recent PC Pick Ups! Clemens in two uniforms is just cool. Schefter is part of a new section of my PC: TV Announcers and Personalities - this includes my Larry King swatch and my Erin Andrews autograph. Just some random Astros and Texans pick ups in there as well. So I went a little Biggio crazy and snatched up some great cards. I will say the GQ and Tribute were eBay pick ups, but the Museum Collection is straight from Wes over at JayBarkerFan's Junk; he actually pulled it while at my former LCS in Spanish Fort, Alabama so a huge thanks for the deal, I sent him a Hammerin' Hank Aaron autograph that I got from a group break. My big question on the GQ mini book is this: where did the black and white patch come from. I can't remember the Astros having that much black in any uniform with the stark white patching. 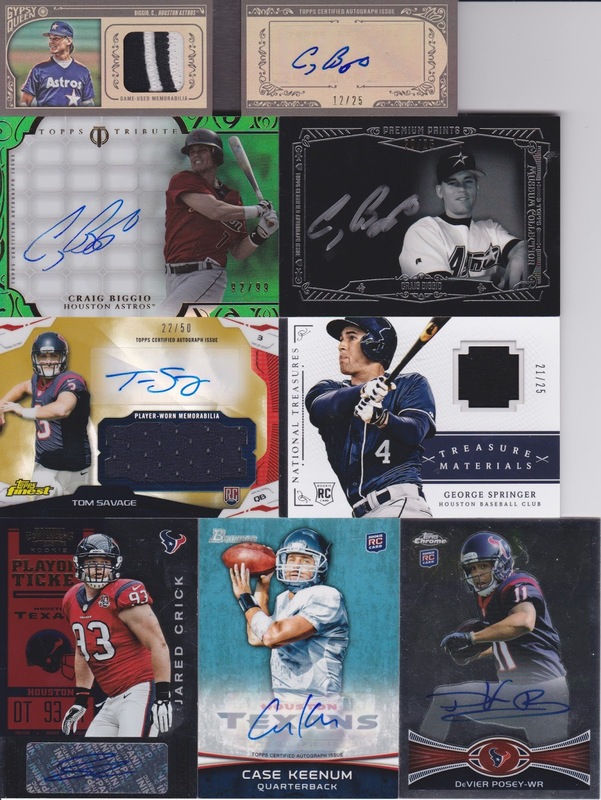 Again, more random Texans and a nice Springer numbered out of just 25 from National Treasure. Oh what Panini could do with a license, this card would look amazing with logos and such. What color were the letters when the Astros had the black uniforms in the early 2000's? Could it be part of the MinuteMaid Park inaugural season patch from 2000? Oooh.. Oooh.. Could be a 1998 All-Star game jersey. They were black that year since the game was in Colorado. Nice pickups! 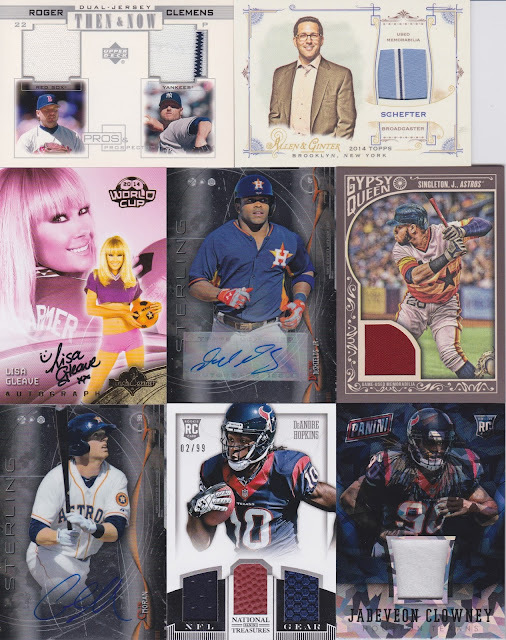 I love the look of the Jon Singleton relic with the creamsicle jersey, and those Biggio's are beautiful! Hey - it's been almost 3 months since this post. Just thought I would mention that. No Really, I'm Still Here... Trade With Me!